The Bön tradition predates the advent of Buddhism in the ancient kingdom of Tibet. The religion and its beliefs, which were initially focused on shamanistic practices based on stories and myths of Tibet’s forefathers, can be traced back to the civilization of Shang Shung in Eastern Tibet. At its heart, the Bön religion centers around the personage of a divine being called Tonpa Shenrab Miwoche, the monarch of the Bön teachings. His consorts and offspring played important roles in the dissemination of the Bön religion in Tibet. Outwardly the Bön religion appears exotic and rather similar to what Tibetan Buddhism has to offer, i.e. salvation or liberation through practice and realizations. But in actual fact, the original Bönpo practices revolved around shamanism and animistic traditions, instead of the individual’s salvation. Thus, practitioners of Bön focus primarily on nature and spirit worship, and the control of supernatural forces. The pantheon of deities within the early Bön tradition varied in their appearances. Some had animal heads, some were peaceful looking, some had wrathful demeanors, some took on human form and others were formless. In terms of belief systems, Bön promises paradise in the afterlife as opposed to the Buddhist belief of liberation through purification, attainments and ending the cycle of reincarnation. Following the introduction of Buddhism into the barren plateau of the Himalayas, the Bön religion then borrowed many scriptural and tantric Buddhist elements in order to ensure its survival within its own homeland. During the introduction of Buddhism to Tibet, Guru Rinpoche or Padmasambhava spent most of his time engaging in psychic wars against nature spirits and other ethereal beings who were displeased with the introduction of a new faith. Each of these unseen beings was subjugated by the Tantric master Padmasambhava, and many came under oath to protect the Buddhist teachings. Some were made responsible for guarding specific monasteries or teachings, while the uncooperative or malevolent ones were sealed in a pit, locked away in a part of Samye Monastery. The Bön religion was thus tremendously affected by the actions of Padmasambhava. As the saying goes, if you can’t beat them, join them. The same applied to the Bön tradition. As they could not hope to overcome the attainments and knowledge of the erudite Indian Buddhist masters who were arriving in Tibet, the Bön yogis decided to take matters into their own hands. Instead of opposing Buddhism, they studied the Buddhist texts and slowly incorporated them into the Bön belief system. Thus, the Bön religion evolved to keep up with the times. The Bön pantheon of deities was revamped into a new system similar to its Buddhist competitor, classified into Father and Mother Tantras. The Transcendent Lords were given consorts, each lineage was led by a teacher, and so forth. Bön deities also took on the familiar iconography that we have come to associate with Buddhism, but were still fundamentally different in that Bön deities were the complete opposite of Buddhist ones. For instance, Buddha Shakyamuni’s right hand touches the earth, but the Bön version of a Buddha has its left hand touching the earth instead. Thus, Bön eventually took on a new life, and the newly packaged religion reestablished itself in Mount Menri, or Medicine Mountain near Mount Kailash. A monastery was built and its leaders took on the title of ‘Mentri’ or throne holders of the Medicine Mountain. As for the Bön meditations and [philosophical] views: in their system there seems to be the systems that the universe was born from eggs or created by the Cha deities, Shiva and so on. These are borrowings from Tirthika views. The dharmas of Bönpos, tirthikas, and so forth are non-Buddhist and should not be taken as our refuge. Bön is not a refuge for Buddhists; it is not worthy of being a refuge … It is vital that you should know the sources of the Bön religion. The source of Bön is perverted Dharma. A creation of nagas and powerful elementals, it does not take one to the ultimate path. These great Buddhist masters were not being hostile towards the Bön religion but were merely recognizing its source, nature, and spiritual potential. There has long been a historical competition between the Bön tradition and Buddhism in Tibet. In general, Bönpo practitioners were stigmatized and marginalized by Tibetans, who labeled them ‘chipa’ (“outsiders”) while Buddhist practitioners were called ‘nangpa’ (“insiders”). In 1978, the Dalai Lama also acknowledged the Bön religion as the sixth principal spiritual school of Tibet, along with the Nyingma, Sakya, Kagyu, Gelug and Jonang schools of Buddhism, after visiting the newly built Bön monastery in Dolanji. Since then, Bön has received official recognition as a religious group, enjoying the same rights as the Tibetan Buddhist schools. This was further reiterated in 1987 by the Dalai Lama, who forbade discrimination against the Bönpos, stating that it was both undemocratic and self-defeating. The Dalai Lama even went to the extent of donning Bön ritual paraphernalia, emphasizing “the religious equality of the Bon faith.” This occurred in 2007, when the Dalai Lama was offered a ‘tenshug’ or a long life prayer by the Yangdrung Bönpos. During this ceremony, the Dalai Lama wore the Bön ritual hat and held the ‘Yungdrung’, a sceptre marked by two swastikas. These emblems are synonymous with the founder of Bön, Tonpa Shenrab Miwoche. On the part of the Bön, offering these highly symbolic implements to the Dalai Lama was a sign of their respect for him as the secular and spiritual leader of Tibet, usually accorded only to the highest Bönpo authorities. On the part of the Dalai Lama however, accepting the implements was nothing less than a seal of his approval and a clear sign of his support for the Bön tradition. Why doesn’t the Dalai Lama persecute the Bönpos? A casual comparative study of the Bön and Buddhist religions would immediately reveal that Bön does not qualify as a proper object of refuge, at least not according to Buddhist principles, Tibetan or otherwise. The Bönpos engage in spirit worship and their practices do not lead one to Enlightenment. These facts have already been established by many eminent masters. Of course, everyone is free to practice whatever religion they wish, and it is not the premise of this article to criticize the Bön. The point that needs to be highlighted is that the Dalai Lama has thrown his support squarely behind the Bönpos, not only officially recognizing these “spirit worshippers” as a spiritual tradition of Tibet but also granting them equal privileges as other Tibetan Buddhist schools. #1: Why is one form of spirit worship (Bön) allowed but not another (Dorje Shugden, an enlightened Buddha wrongly believed to be a spirit)? #2: Why does the Dalai Lama recognize the Bön spirit worshippers as the sixth principal spiritual school of Tibet but try to extinguish the practice of Dorje Shugden, claiming that it is demon worship, non-Buddhist and therefore practically illegal? #3: Why does the Dalai Lama welcome Bönpo spirit worshippers with open arms when their teachings are completely at odds with Buddhist principles (Jetsun Milarepa even called the Bön religion “perverted dharma”) yet ban the practice of Dorje Shugden (which is in accordance with the tradition of Lama Tsongkapa) because it will supposedly cause Tibetan Buddhism to degenerate into spirit worship? #4: Why does the Dalai Lama support the Bönpos, allowing them the same privileges as the other Tibetan Buddhist schools while taking away the rights of Shugdenpas? 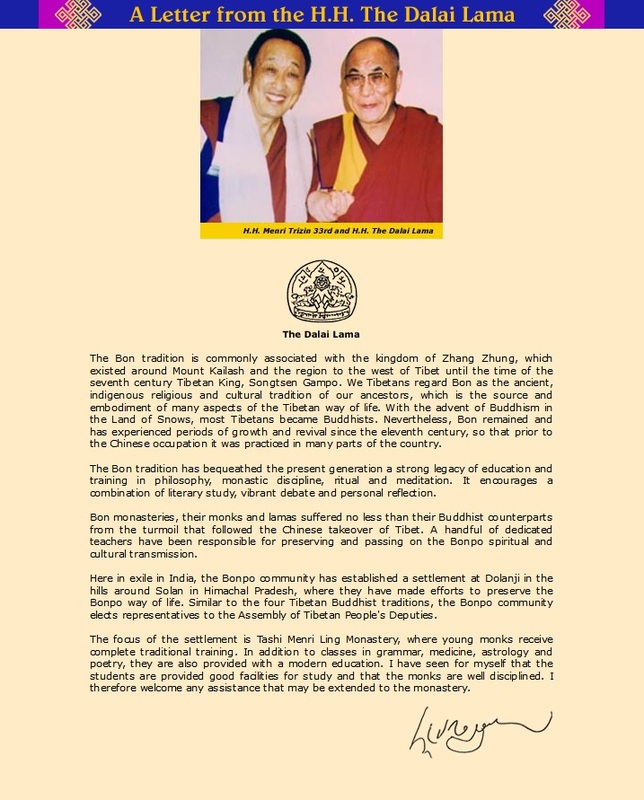 #5: Why were Bön practitioners granted the privilege of audience with the Dalai Lama back in 1977, but Shugdenpas are denied all requests for dialogue to address the Dorje Shugden ban? #6: Why are Bön practitioners invited to hold office in the Tibetan administration while Shugdenpas are specifically excluded through legislation? #7: Why does the Dalai Lama forbid and speak out against discrimination of Bönpos, but remain silent and even subtly encourage the discrimination of Shugdenpas? #8: Why is it undemocratic and self-defeating to discriminate against the Bönpos but perfectly alright and even necessary to isolate Shugdenpas and not have any association, material or otherwise, with them? #9: Why does the Dalai Lama invite Bön leaders to gatherings of “heads of Tibetan Buddhist sects” but expel Dorje Shugden practitioners from their monasteries? #10: Why does the Dalai Lama pose for photos with Bön leaders and practitioners, accept their offerings, wear their ritual implements while any form of association with Shugdenpas, monetary transactions or even a photo, is forbidden? These questions above are enough to raise deep concerns about the Dalai Lama’s true motives in supporting the Bönpos while banning Dorje Shugden and condemning the Shugdenpas to a life full of discrimination and ostracism. As the spiritual and secular leader of Tibet, the Dalai Lama should have impartiality and practice equanimity towards all religions, whether Buddhist or otherwise. Unfortunately, the truth is that the 14th Dalai Lama, Nobel Peace Prize winner, is not practicing the loving kindness, compassion and tolerance that he preaches, to the detriment of all Dorje Shugden practitioners living in Tibetan communities and beyond. A photo courtesy of the Dalai Lama’s private office. The original caption reads ‘His Holiness the Dalai Lama with the heads of Tibetan Buddhism sects’. Note how the Dalai Lama affectionately holds the hand of the Bön leader while the Ganden Tripa, head of the Gelugpa school of Buddhism stands at the far right. One can only conclude that the Dalai Lama’s support for the Bön and his ban against Dorje Shugden are for political gain – to gain the support of the Bönpos while making Dorje Shugden a convenient scapegoat for the failures of the Tibetan administration. There is no other reason why a master as erudite as the Dalai Lama would accept and recognize a practice which is not rooted in Dharma (Bön) but reject a deity and practice which originates from the sacred pantheon of Buddhism (Dorje Shugden). Hear hear, what a great article !! Such hypocrisy from the false Dalai Lama !! Dalai Lama has been treating Bon practitioners equally with other religious. He knows so well that worship the Bon spirit will not lead to enlightenment. Somehow he recognise the Bon worshippers. In fact this is what we want to see. We should respect others religious freedom and not condemn to create any controversy. We hope His Holiness Dalai Lama will soon realise this and lift the Shudgen ban. Ah, I understand more and more each day what a politician is the evil false Dalai. So, he likes any group that doesn’t have political disadvantage for him. So, Gelugpas who rely on Shugden were too powerful and imporatant– like Trijang Rinpoche, so his “holiness’ had to demonize the practice. He has this pretend China Karmapa (sorry China— there really is reincarnation— the real Karmapa is not the communist Chinese boy) who he just picked (without authority to do so) because you know he is like hey, let’s get rid of another powerful lama that competes with me…. the Karmapa… so he picks the China boy, and tells the west he’s in charge of that sort of thing….. alas west, decides to use the Dalai in their positive brainwashing against communism…. freedom in exile— poor peaceful amazing aristocratic leader leaves for west looking for peace and freedom while the commies come after him with tanks…. So you might as well study Bon as study with the Dalai— neither transmission is coming from Buddha…. This is why DS practice has been discouraged by many. See one quote from Pabongka of what he thinks of the Bonpos. If Pabongka has said this in this age he would by now be behind bars for hate crime. This fact is one in a line of many others. Can’t people see this or are they obscured by H.H.’s large than life figure? If there was no Dorje Shugden controversy, I would think HH Dalai Lama is such a open, tolerant, respectful and kind person. He respects others’ religion, no discrimination at all. He also have friends of other religious heads from Catholic to Muslim, constantly promoting world peace. However, this is not true at all, while he shows how open and tolerant he is to other beliefs and faiths, he is suppressing and discriminating his own Tibetan people who practice Dorje Shugden. He may not have released an official Ban but there are many proofs that discriminations to Dorje Shugden do exist among the Tibetan community. Even on the CTA website, there is a hit list of Dorje Shugden practitioners who have not committed any crimes at all. HIs Holiness, please be fair to your own people! This is good evidence and knowledge for the people who are anti Dorje Shugden. The example that Dalai Lama is so clear for all to see. Why would the Dalai Lama pick on one protector and not other unenlightened protector and practices and despite it arose from a line of realised teachers all the way back to birwapa, who founded the sakya lineage. Perhaps that was that was the real reason Dorje Shugden sought shelter with the Sakaya Lineage initially. The Sakya would recognise his nature easier than other lineages. If the Dalai lama can go against the Gelug lineage, when will he move on to the other lineages? The Dalai Lama does not need to admit the Jonangpas and the Bon in actual fact why does he do that. The Bon are clearly non buddhist in nature and they have their right to practice. So why is Dalai Lama so tough on the Gelugs? Perhaps in an example I heard sometime back a zen teacher would be tough on some students as that teacher knew those students will have to brave the challenges of the world, for the ones who don’t have to face the world, he was relaxed with them. Anti DS people there is no clearer example, why would the Dalai Lama endorse the worship of spirit if he is not doing it with a hidden motivation? There is alot of Why to Dalai Lama enforce ban on Dorje Shugden Practitioners, but welcome the Bonpos, even though they are Spirit worshipper. This just does not make sense at all, as Dorje Shugden are known to be the the manifestation of Buddha Manjushri, and the lineage can be trace back from TDG to Lord Manjushri. whats more Dorje Shugden is the Dharmapala who protect the Teachings of Lama Tsongkhapa and Buddha Dharma as a whole, it really does not make sense, becasuse an enlighten protector deemed spirit and His practice is Ban. But the Bon who are not Buddhist and worshipping spirits are welcomed. But looking at the bigger picture, this is a cause for many to question on Dalai Lama actions on accepting Bonpos and persecuting Dorje Shugden Practitioners. This will lead many to know more about the history of and origin of DS, and how beneficial it is for many, with this Dorje Shugden practice will spread like wild fire. Bon practices spirit worship big time. So why is HHDL and CTA ok with that? Why are they picking on the practice of Dorje Shugden? How about Hinduism? They have a pantheon of deities that are not enlightened. Why are they not discriminated and ostracized? There is so much inconsistency with their claims. Regardless, everyone has the right to their own religion. If CTA wants to look good, they should lift the ban, stop lying about it and move on. All this bad press do not serve them if they want support from Western countries. Honestly, two points I would like to share are: (1) HHDL is a well known high Lama, he also the Noble prize winner I don’t have qualify to comment what had he done towards his own students, Bon practitioner and Shugdenpas. My thought is we cannot doubled standard for one same issue. It will make public like me feel confuse or lost what is the direction I should follow? If HHDL can recognize Bon then DL must also accept Dorje Shugden. I think this is fair enough for each part and avoid conflict between different group of student and lineage. As icon celebrity of Buddhism sector, DL always become the focus point for all the international medias. Whatever DL said and do will create a huge impact towards the public. So, my point is everything must be fair for each part, because it is basic of Buddhism philosophy—equanimity. Second, I also truly believed that HHDL have more deeper meaning in behind why he make this decision. Like what I said above, he is high Lama and as well known high incarnation Lama, he should be very clear the consequences after the decision. May be I not enough merit to see through this issue, but I believed he can. Out of full compassion, seem like DL make a lot of conflicts in this current period, may be those conflict will turn into good result after time flying…??? I hope so! My comments seem like paradoxically but I too speak out through bottom of my heart. I believed many people also have same feeling like me. Thank you for create this platform for us to share our thought and opinion. Dear HHDL, my humble request to you as a high reputation Enlighten Being like you, can His Holiness explain to us and all the people around the world, why His Holiness can accept and tolerance Muslim, Catholic, Christian, now is Bon, but why not Dorje Shugden practice? Why His Holiness like to avoid the Dorje Shugden issue which have been going on so many years? What wrong of this group of people? I wish HHDL can give the public a very clear explanation why the Dorje Shugden practitioner and supporter be treat badly all the time? Are they deserve it?If yes, why? If not, the reason? Waiting for His Holiness response. different religions are different in their believes. Buddhism believes in karma, re-incarnation, etc. some believe in heaven/hell after life, etc. Though I am a buddhis and believe in karma and all, i can’t say go around condemn other religions and say they are wrong. instead, we need to be open, accepting, tolerating and embracing. But does it mean we simply accept all religions, even some preach to kill others? IMHO, we should accept religions which do not hurt others and do no preach to heart others. As such, Bon may be worshiping spirit, but they didn’t hurt others, and I don’t see any issue with HH Dalai Lama accepting Bon. Actually, I feel it is necessary to accept Bon. However, just because HH Dalai Lama conveniently claim that Dorje Shugden practitioners are related to China and causes division/disunity within Tibetan community, Dorje Shugden is suppressed. Furthermore, this false accusation is baseless. Dorje Shugden practitioners focus on learning the Dharma and spread the teachings of Lama Tsongkapa, why Dorje Shugden practitioners receive such different treatment from Bon practitioners? It is time to lift the ban already!! It baffles anyone completely why Dalai Lama had recognised Bon instead of Dorje Shugden! If Dalai Lama could not provide satisfactory answers to these ten questions as set forth in this article, Dalai Lama had failed miserably as a Nobel Peace Prize Winner and specifically as a prominent Buddhist leader and monk! Dalai Lama simply does not practise what he taught! Are there hidden meanings within Dalai Lama’s actions to recognise Bon and to ban Dorje Shugden? This is ridiculous how can a spirits worship can be recognize DS is a emanation of Buddha Manjushri yet the ban is never end so much suffering for people who practices the lineage , where is the fairness very sad ! The common problem that the Dalai Lama created is 1) the lack of consistency and 2) the abundant of contradiction in his actions of body and speech. His Holiness action is inconsistent from one moment to the next, with one person to the next and from one place to the other. How can the Dalai Lama endorse one spirit and oust another (assuming that Dorje Shugden is a spirit as he claims)? How can His Holiness give rights to the Bonpo practitioners while he ostracize Dorje Shugden practitioners to the extent that they are deprived of basic resources like medical services and entry into sundry stores. This gives a poor portray of this icon that does not only jeopardize the Gelugpa lineage but the spiritual world as a whole. 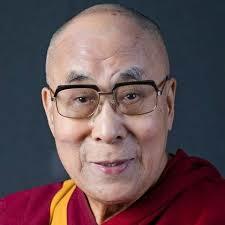 His Holiness is the leader of the Tibetan spiritual world. However, his action contradicts the fundamentals of Lord Buddha’s teachings such as equanimity. It is also the duty of a spiritual leader to redirect his people from actions that will lead to lower rebirth: by endorsing the Bon worship, the Dalai Lama is literally leading his people to the 3 lower realms. Contradiction also manifests in the Dalai Lama’s meddling with the Karma Kagyu lineage where he enthroned his own Karmapa. This goes against the tradition of the lineagage where the Sharmapa is the assigned authority to enthrone the Karmapa. This damaging action is spreading onto his followers who are behave vulgarly in public. What else could one expect, people look to their leader for guidance and if His Holiness’ speech and actions are laced with hypocrisy and his non-action is one that endorses violence, then the followers can only be expected to be the same. Well, well, the Dalai Lama seemed desperate to grasp control of more Tibetans-In-Exile rather than keep the purity of the lineage teachings. Recognising and supporting Bon practises goes against the Lamrim teachings as it will not bring one to enlightenment. No matter how the Bon had adopted much of Buddhist tenets, their are still lacking. Here we have enlightened Dorje Shugden, a centuries old practise propitiated by lines of highly attained Masters, including the 5th Dalai Lama, Pabongka Rinpoche, Trijang Rinpoche, etc., accused of being a “Spirit”, whilst the real “Spirit” worshipers are declared valid. How much more farcical can it get? Next if they submit the Christians will be the 7th school and maybe Jews will be the 8th…sorry, not out to demean the Christians and Jews (just using examples). Please please please Dalai Lama, manifest your true nature and stop grasping for political control which is destroying the very foundation of your own school, the Gelug, Lama Tsongkapa’s teachings and the blessings from your teachings. If this is true, then the Dalai Lama should forbade discrimination against practitioners of Dorje Shugden as it is both undemocratic and self-defeating too. What is sauce for the goose is sauce for the gander too. The questions raised in this article is very pertinent and valid. But, how can we understand what the Dalai Lama is doing as all his actions have been contradictory and makes no sense? How can recognizing the Bon be politically advantageous and discriminating against the Shugdenpas be advantageous? Guess, only the Dalai Lama can answer that.